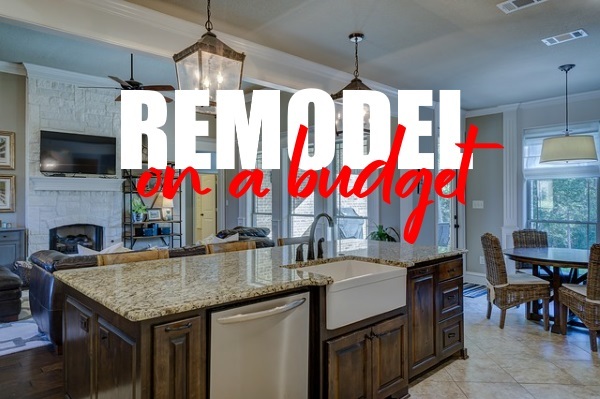 When wanting to remodel your kitchen, it can immediately seem overwhelming because of the sticker shock you initially see in having to replace appliances, resurface countertops, change out the cabinets, and more. Updating to modern interior trends shouldn’t have to be expensive though! Here’s how to remodel your kitchen on a budget. Interior designers and renovations are probably what’s on your mind upon hearing the word remodel. Changing up the kitchen doesn’t have to be as drastic for it to get the look you want. Without changing the layout of your kitchen, these thrifty tips can level up the look of your kitchen using your own talent and only a minimal budget. It’s always important to follow safety measures when working with tools, appliances, and being in the presence of sawdust. The good news is that safety can be done on a budget too! Pick up a pair of cheap safety glasses and dusk mast. For clothing, consider wearing an old t-shirt and a pair of stretchy and comfortable leggings or gym shorts. Buying new pieces of furniture already sets you back by thousands of dollars. If buying just one would already limit your costs in other expenses, just let go of that option. However, you don’t have to sacrifice new furniture altogether. Instead, consider building your own furniture! Not only will this help save some serious cash, but there will also be sentimental value tied to the furniture you design. If you don’t already have one, get an affordable table saw and consider crafting a farm table, chairs, or even cabinet doors out of wood! Cabinets take up quite a huge space in your kitchen. If they’re that prominent, ugly cabinets may mean an ugly kitchen. Changing up your cabinets instantly upgrades the look of the whole kitchen. If your cabinets are still in good condition, refurbish them rather than buying new ones! Renewing cabinets can be done in a number of ways: repainting, changing the cabinet doors or replacing the hardware and knobs. The material of the cabinet itself, which is typically wood, can have different finishes. Mix up textures and colors to follow a cohesive theme in your kitchen. If you don’t have enough budget for changing the cabinets, consider open shelving to store kitchen tools and for displaying your food. Losing the cabinet doors and even the walls have advantages both functionally and aesthetically. It opens up more space and offers easy access to everything you need for cooking. Open shelves won’t cast as many shadows, brightening and widening up the room in the process. It also looks more modern, which will update your kitchen interior to more current trends. One of the ways we mentioned to upgrade your cabinets is to repaint them. Skip choosing a color and opt for white right off the bat. It’s a classic neutral color that even designers pick often. White not only reflects light into the room, it easily matches any color too. You won’t have any trouble decorating because white opens a lot of options. This can help save money in other areas of the kitchen because you won’t have to worry about the cabinets clashing with other parts. It’s also a trick to make the room look more contemporary. Regardless of what room you’re working on, fixing the lighting is one of the tricks that make it better. In the kitchen, an ample amount of brightness is ideal for most cooking and dining activities. Instead of the traditional built-in lights, the on-trend industrial lighting nowadays would modernize the look of your kitchen and spread out light sources where you need them. Aside from the instant aesthetic upgrade, industrial light fixtures can also be cheaper than large overhead lights. You can find affordable pendant lighting options that look designer and whose cost wouldn’t bore a hole in your wallet. Since they’re currently popular, you can easily find pieces tagged with budget-friendly prices in common places like IKEA. Aside from kitchen tools, wares and decor, appliances make up the majority of what’s in your kitchen. Since you might already have the big ones like the refrigerator, stove, and microwave, go all out with everything else. Small appliances like bread toasters, blenders, food processors among many others act like accessories for your kitchen. Refurbishing doesn’t have to mean big expenses. By changing parts of these small appliances, you can make them complement the new cabinet paint or match the accents of the other bigger appliances. It’s a game of mixing and matching, and these small ones are a good area for the experiment because you can always choose to display or hide them according to your preference. When your kitchen is outdated, your whole house seems outdated. These little upgrades have prominent improvements that affect the overall look. Don’t worry so much about the cost, these changes won’t break the bank either.